Sri Lanka ODD 2019 is about to finish. Galle District is all set to take on Colombo District on Thursday, April 11, 2019, at Rangiri Dambulla International Stadium, Dambulla. 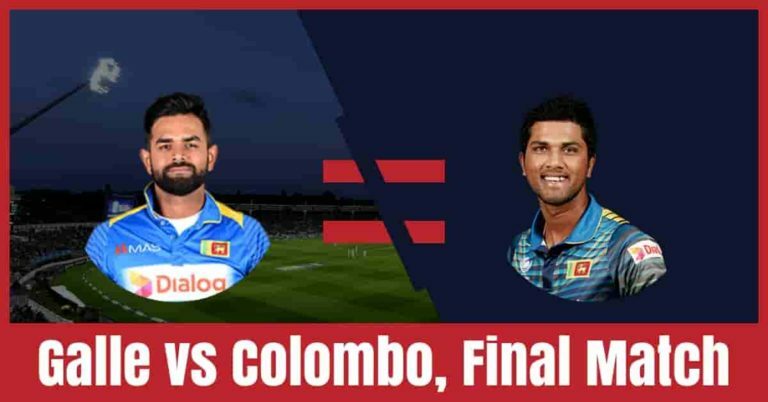 If you are looking for the best choice for captain and vice-captain, who will win the match today, players injury updates, and GAL vs COL latest news then you are the right place. We have covered all the above information on this post and the best part is you can read all the details for free. If you want to increase your winning chance to 100% then make sure to read the complete post. All the information, details and statistics in this post are taken from very reliable sources and very accurate. Galle District has played 3 matches, won 2 and one match had no result. They have finished on the first position of the points table with 12 points in their pocket. They have defeated Kandy by 156 runs and Dambulla by 76 runs. Dhananjaya de Silva, Minod Bhanuka, Sandun Weerakkody and Milinda Siriwardana are the top scorers of Galle team. They have scored 128, 120, 114 and 105 runs. Lasith Malinga, Dushmantha Chameera and Dhananjaya de Silva are the top wicket-takers. They have taken 8, 4 and 3 wickets. On the other hand, Colombo has finished in the second position of the points table with eleven points in their pocket. They have also played 3 games, won 2 and one game had no result. They have won their first match against Dambulla by 82 runs. Prior to that, they have won against Colombo by 3 runs. Shehan Jayasuriya, Angelo Perera, Avishka Fernando and Dinesh Chandimal are the scorers of Colombo team. They have scored 116, 90, 86 and 77 runs. Akila Dananjaya, Suranga Lakmal and Chamika Karunaratne are the top wicket-takers. They have taken 6, 4 and 4 wickets. Sandun Weerakkody, Lahiru Thirimanne, Dhananjaya de Silva, Kusal Mendis, Lasith Malinga and Dushmantha Chameera are the key players of Galle Team. Lahiru Thirimanne will lead the GAL Team. Sandun Weerakkody, Lahiru Thirimanne and Kusal Mendis will lead the batting department. Dhananjaya de Silva will play as a key all-rounder. Lasith Malinga and Dushmantha Chameera will lead the bowling department. Sandun Weerakkody and Dhananjaya de Silva are the most valuable players of GAL team. Batsmen: Milinda Siriwardana, Sandun Weerakkody, Lahiru Thirimanne, Kusal Mendis. All-Rounders: Dhananjaya de Silva, Wanidu Hasaranga, Lahiru Madushanka. Bowlers: Dhammika Prasad, Lasith Malinga, Dushmantha Chameera. Lahiru Thirimanne (c), Mahela Udawatte, Minod Bhanuka (wk), Dushmantha Chameera, Sandun Weerakkody, Lasith Malinga, Dhananjaya de Silva, Lahiru Madushanka, Kusal Mendis, Dhammika Prasad, Milinda Siriwardana, Shammu Ashan, Wanidu Hasaranga, Shehan Madushanka, Nishan Peiris. Shehan Jayasuriya, Angelo Perera, Avishka Fernando, Dinesh Chandimal, Akila Dananjaya and Chamika Karunaratne are the key players of Colombo Team. Dinesh Chandimal will lead the COL Team. Avishka Fernando, Upul Tharanga and Dinesh Chandimal will lead the batting department. Shehan Jayasuriya and Kamindu Mendis will play as a key all-rounder. Akila Dananjaya, Chamika Karunaratne and Asitha Fernando will lead the bowling department. Shehan Jayasuriya is one of the most valuable players of Colombo team. All-Rounder: Shehan Jayasuriya, Kamindu Mendis, Seekkuge Prasanna. Bowlers: Akila Dananjaya, Chamika Karunaratne, Asitha Fernando, Suranga Lakmal. Dinesh Chandimal (c & wk), Asitha Fernando, Avishka Fernando, Ashan Priyanjan, Upul Tharanga, Seekkuge Prasanna, Angelo Perera, Shehan Jayasuriya, Chamika Karunaratne, Mohamed Shiraz, Kamindu Mendis, Suranga Lakmal, Akila Dananjaya, Chamara Silva.